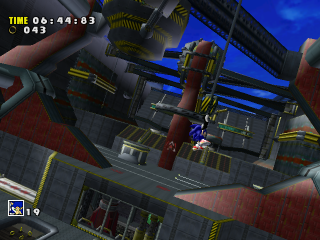 Sky Deck is an action stage in Sonic Adventure located aboard the Egg Carrier. It contains cannons, mini-robot plains, changes in "gravity", high winds, and plenty of interesting distractions. It appears to go all the way around the Egg Carrier, and, similar to Hot Shelter, suggests the Egg Carrier is bigger than it first seems. Sonic and Miles "Tails" Prower must go through this stage to get to the bridge and rescue Amy from Eggman, while Knuckles has to scour this stage for the final pieces of the Master Emerald. The first section is available to Sonic and Tails. It consists of several narrow walkways with hurdles and badniks a plenty. To add to the speed is a gigantic cannon which will attempt to destroy the duo, even destroying bits of the ship just behind them. Several ladders and ramps lead the way, ending with delivering a rocket squarely in the cannon's barrel, destroying it. The second section is only available to Sonic, which takes place on a large hangar of the Egg Carrier. Occasionally, gusts of wind blow, nearly dragging Sonic off the side of the ship if he does not clutch onto an object. The goal for this section is to simply destroy yet another cannon which pivots to face the hedgehog. This section also shows a launch area for the flying badniks encountered in the Sky Chase minigames. Parts of this section will again crumble and fall, which will drop Sonic to his death if he does not reach the area with the cannon quickly enough. The final section is available to Sonic and Knuckles, a large open area with switches that can tilt the ship. Barrels roll out from storage areas, badniks lurking throughout to stop the hedgehog and echidna. Knuckles must recover the Master Emerald shards located in the area, while Sonic must ascend to the top to find the capsule, as well as the interior of the Egg Carrier where E-102 Gamma was stationed earlier. This page was last edited on 9 October 2018, at 15:01.